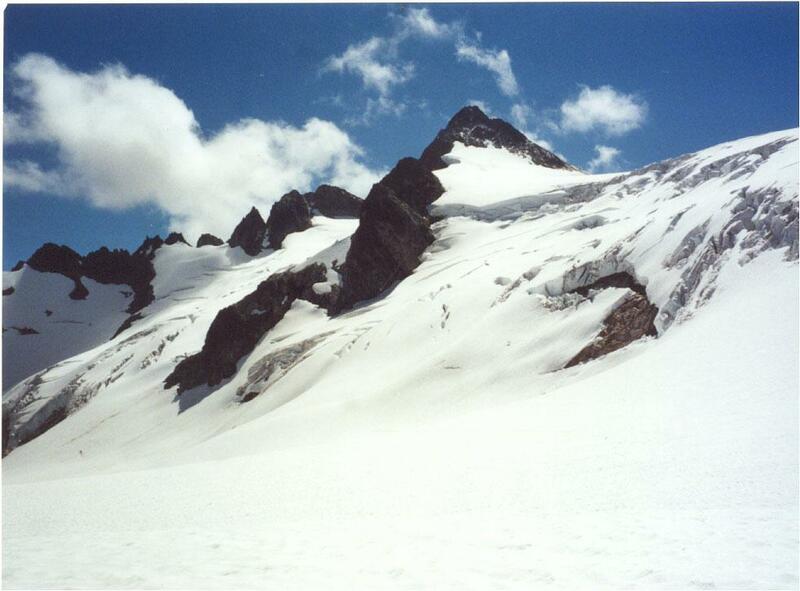 The Accumulation Zone: is the zone of the glacier where snowfall exceeds snowmelt. 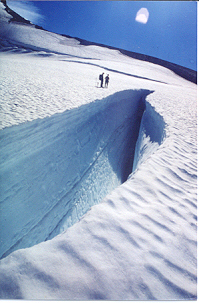 An Icefall is an area of rapid movement on a steep slope with extensive open crevassing. 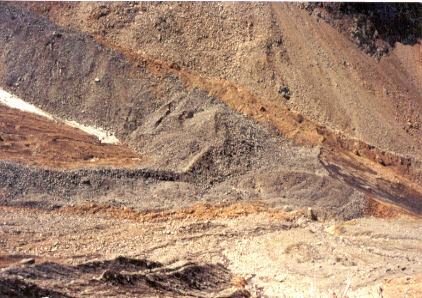 A Moraine is a pile of debris carried down glacier and dumped at its end-terminus or lateral margin. 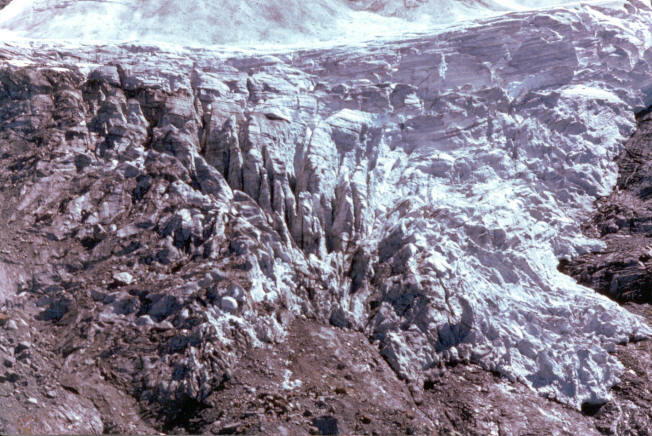 An Active Glacier is moving at reasonable pace has crevassing and is eroding its bed. Glacier Runoff such as this stream draining Sholes Glacier is the melt from the entire glacier. 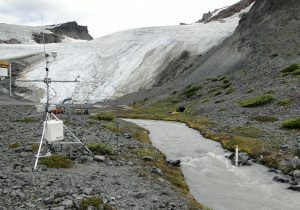 It is highest on warm dry days when runoff from other sources is at its lowest. Glacier Flour causes the blue green color in this Lake on Mt. Daniels. The flour is clay sized particle resulting from the glacier eroding the rock at its base. 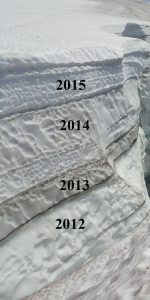 Crevasse Stratigraphy Like reading tree rings the annual snow layers are visible in crevasses and can be used to determine annual snow accumulation. 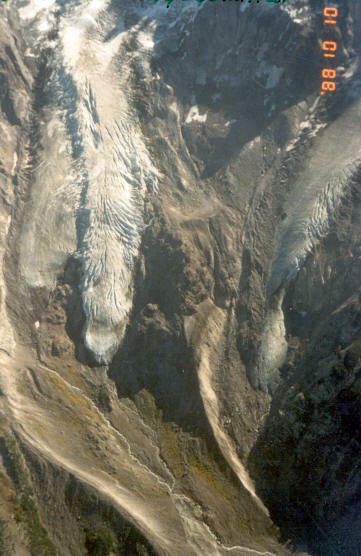 Lateral Moraines mark the edges of a glacier. 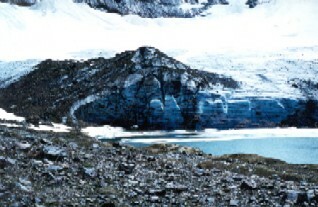 In this case the lateral moraines extend well below the terminus of the current Kennedy Glacier, marking its maximum size in the Little Ice Age. 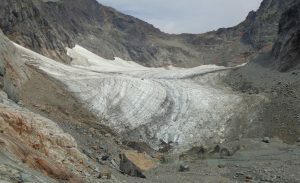 Terminus is the end of the glacier. 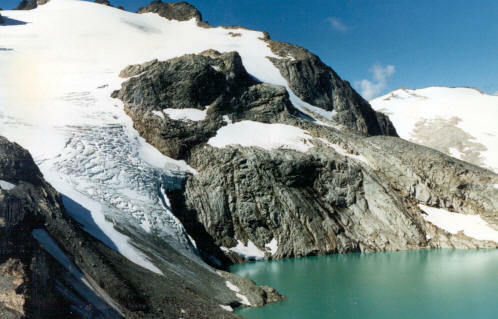 Proglacial Lake is a lake beyond the terminus of a glacier. 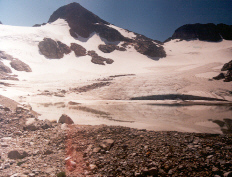 Glacier golf is a game played with rocks and sticks across rough alpine terrain. 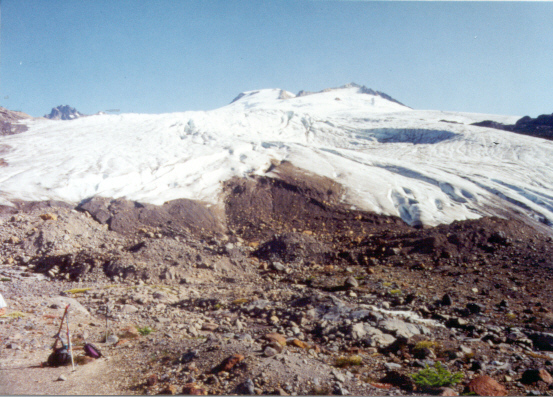 1995 Mt. Daniels Open. Eventual Champion Bill Prater left examines form of Mauri Pelto about too tee off over the water hazard. 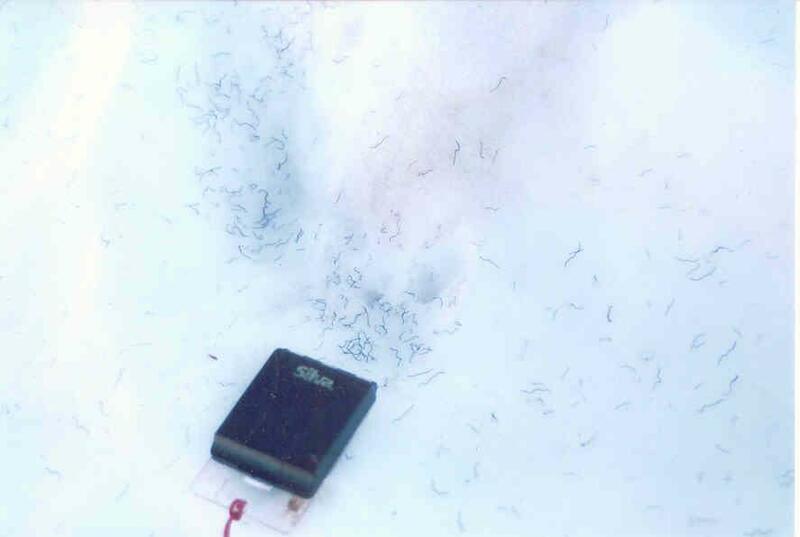 Ice Worms live on glaciers appearing largely in the evening when solar radiation is at a minimum. 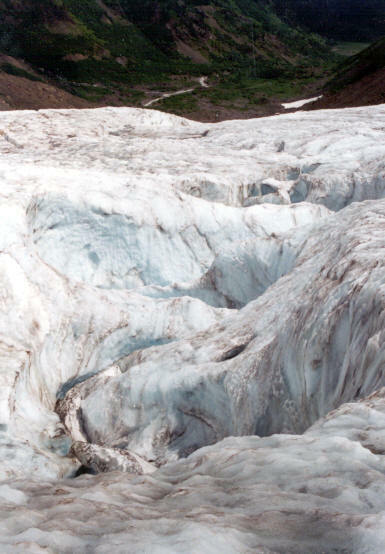 We found that over a billion ice worms inhabit a single glacier. 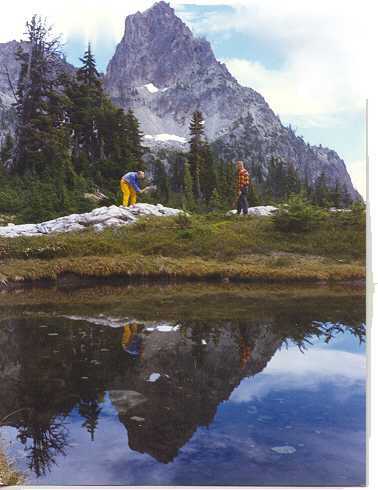 Collembola- Springtails-Snow fleas: Most species of Collembola found on glaciers of the North Cascades are also found off glaciers, on snowpack, on pools of water, or in duff in the forest. 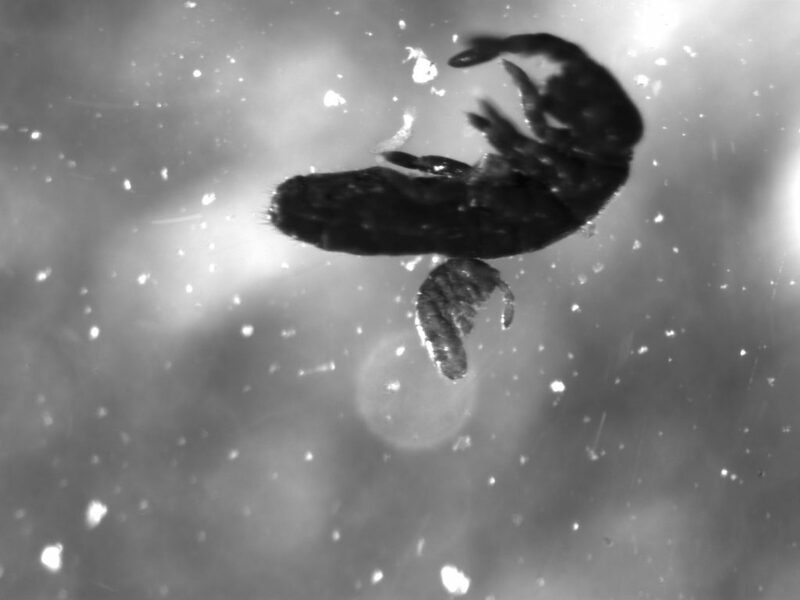 At least one kind of Collembola (here referred to as the “Behemoth” (Agrenia n.sp.)) 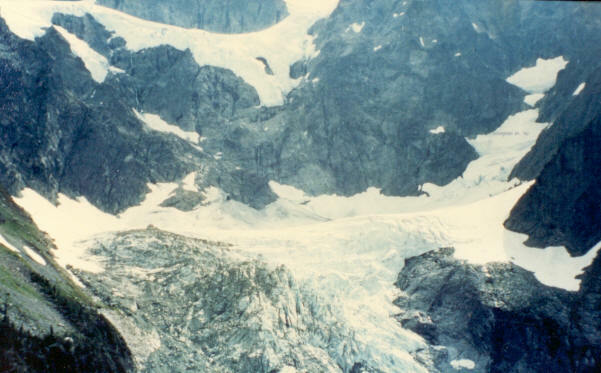 appears to occur only on the glaciers of our region — not off glaciers, and not in other regions.